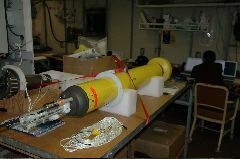 9 APEX-SBE profilers with oxygen sensors were deployed in November 2005 to provide background profile context for the CLIMODE experiment. The floats were parked at 500 dbar and alternately profiled from 500 dbar and 1800 dbar to the surface every 5 days. We are also tracking three Argo floats deployed by UW in the region: 5068 and 5069 (with oxygen sensors), and 5051 (paired with 5068 but without oxygen sensor). 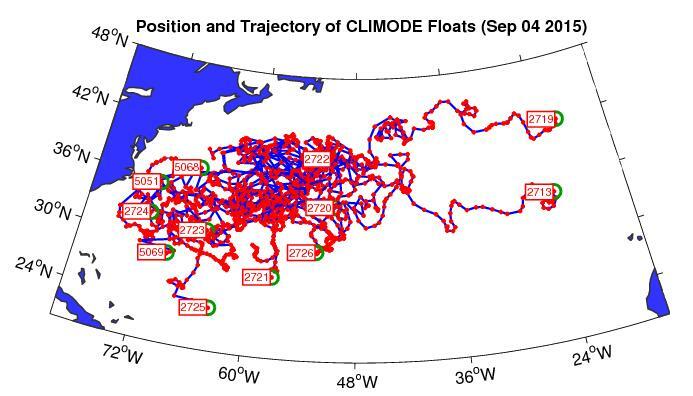 The first figure shows the float trajectories; green circles indicate last location. for a more comprehensive set of plots including oxygen, click on "27nn SIO"
for link to original data, click on "27nn UW"
In the profile cascade plots, potential temperature range 17-19 degC is indicated in red as a rough indication of the presence of EDW. Float 2720: as of October 7, 2006, stopped reporting (66 total profiles). Float 2721: as of September 3, 2007, stopped providing data (131 good profiles). Float 2722: as of April 27, 2006, stopped providing accurate profile data (35 good profiles). Float 2723: as of May 22, 2007, stopped providing data (110 good profiles). Float 2725: as of July 21, 2006, stopped providing accurate profile data (49 good profiles). Float 2726: as of January 18, 2007, stopped reporting (87 good profiles). Float 2713: as of October 31, 2007, stopped reporting (144 good profiles). Float 2719: as of October 13, 2007, stopped reporting (140 good profiles). Float 2724: as of April 8, 2008, stopped reporting (174 good profiles). Float 5069: as of March 24, 2010, stopped reporting: consumed its energy (116 good profiles). Float 5068: as of November 23, 2011, stopped reporting: consumed its energy (182 good profiles). Gyre-scale context for the intensive EDW formation experiment, which is concentrated near the Gulf Stream Extension, is provided by Argo and Argo-equivalent profiling floats and very limited CTD sampling. Estimates of EDW volume are to be mapped coarsely throughout the western part of the gyre. Variations in upper ocean circulation, thermocline and oxygen structure will be mapped monthly. Our profiling floats include oxygen, unlike the WOCE floats and the acoustically-tracked floats, giving additional information on formation processes, rates and advection (Jenkins, 1982). Winter near-surface oxygen undersaturation is an indicator of convective mixing (Talley et al 2003a). The CLIMODE Apex float program includes 9 APEX-SBE profilers with Aanderaa oxygen sensors. The floats are parked at 500 dbar and profiling from 1800 dbar to the surface, every 5 days. These and the Argo floats will yield 80 to 90 profiles per month, and will extend the WOCE EDW PALACE float study of 1997-2002 (Kwon and Riser, 2004a,b) (http://flux.ocean.washington.edu), which had 53 functioning floats, with about 40 to 170 profiles per month. Monthly mixed layer depth, EDW volume, temperature, salinity, oxygen, and thermocline structure will be produced from the weekly float profiles. The cruises will provide some transect information. CTD profiles from ongoing programs (e.g. Bermuda time series, CLIVAR repeat hydrography) will also be incorporated. These products will provide the overall thermocline shape and circulation in which the EDW is embedded. We will also work with historical float and hydrographic data (e.g. Talley and Raymer, 1982; Talley, 1996; Joyce and Robbins, 1996; Lozier et al., 1995; Owens 1991; Molinari et al 1997; Kwon and Riser, 2004a,b), to provide the climate context for the intensive field phase (North Atlantic Oscillation phase, mixed layer properties and vigor of EDW formation, strength of recirculation and dispersal of EDW). This material is based upon work supported by the National Science Foundation under Grants No. 0424893 and 0960928.